Well this is unlikely to be any sort of big reveal. My hidden gem is my backyard. I love it back there. There’s nothing particularly awe-inspiring about it- we don’t really garden so the stuff that is growing is all thanks to the person before us who planted it and whatever force of nature keeps it from dying. It’s chock-full of kids’ toys: there’s an 8-foot trampoline (I almost wrote piano… it’s been a day), a plastic house, a plastic slide, a sand-and-water table, various balls, a scooter, usually one shoe, some crayons, paintbrushes and a popped balloon or two. Oh, and a Little Tykes car and a donated bicycle that is slowly rusting in the corner. Plus, we have two grown-up chairs for rocking. Like I said- chock-full. And I think that’s why I love it. It’s so us. This is a place where, while it’s cool enough, my family spends a great deal of time. The kids are back there every day and it’s fun watching them toddle around, finding something new and interesting in every corner. It has a high, cement fence so it feels very private, even though it backs up to the school. The crazy acacias that are taking over the yard are making it harder and harder to see the school and I’m okay with that. And I don’t mind if it’s messy. I wouldn’t say I’m really a neat-freak, but I definitely appreciate spaces more when they are not cluttered (read: I can sit down and relax versus feeling the need to clean). But I don’t have a problem with the one shoe. The popped balloons bother me because someone- be it a two-legged or a four-legged someone- could gobble that up and we’d have a problem. Aside for those, I let things lay where they lie. Bahrain is a far more liberal Muslim country than it’s neighbors to the West and North (Saudi Arabia and Kuwait) and while there is no rule that you can’t wear shorts out in public, it’s seen as a bit rude to show your knees. And also your shoulders. I feel uncomfortable going outside of my house in shorts, which makes the late spring and early summer almost unbearable! It is NOT a dry heat in this desert. We are an island- it gets Georgia humid… and a good twenty to thirty degrees hotter. Being in anything other than shorts is miserable… so the backyard is a safe haven- a place to be comfortable when it’s hot… but not too hot (yet). The only thing that would make my backyard more perfect, in my mind, is a table. Right now, if you take a drink or a snack outside, you must be on constant guard from the running kids and the playing dogs. You can’t really put anything down and expect it to still be there when you next turn around. But the place is already so full that I’m not sure where this imagined table would actually go. I know there are beautiful places to be seen in Bahrain. Apparently there is a botanical garden a little ways away and I’d love to go. I’d love to find a special place that is calm and quiet, beautiful and peaceful. For now, though, I’m happy enough in my backyard. We are slowly turning our back yard into one of my favorite spots too! It's nice having a place that you love to go right outside your back door! 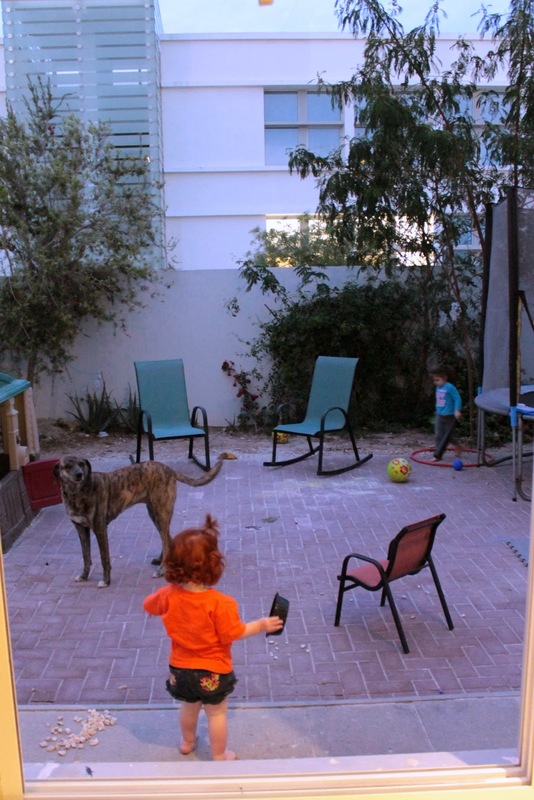 There's nothing like a backyard oasis when there are toddlers in the house. We spent so much of our time in the UK in our back garden (our older two kids were 2 and 1 years of age then). The weather was a bit different than yours, but still, good memories.